Blade Runner is a movie that has, rightfully, gained a cult following among both science fiction and cyber punk aficionados. The movie is a much a story about the life of a "blade runner" as it is a stylized rendering of a gritty melting pot of urban cultures in the near alternate future. Blade Runner is the movie follows the trail set by 2001, to deliver a slow paced and immersive thriller. Set in a seedy metropolis (Los Angeles of the future), Blade Runners are cops employed to "retire" runaway androids. In an attempt to support off-world exploration requirements, the Tyrell corporation bio-engineers sophisticated humanoid robots (called Replicants), that are used for hazardous mining and other operations. After a revolt outside Earth, Replicants are declared illegal under the penalty of death. However all Replicants have a crucial flaw built into them. They can only live for four years. The reason for this was the fact that while a Replicant was endowed with all human prowess, they did not have enough time to accumulate experiences to develop an emotional personality. 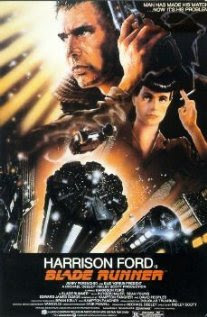 In November 2019, Rick Deckard (Harrison Ford), a Blade Runner is called out of retirement to persue a team of four Replicants that has infiltrated L.A. As he reluctantly sets off tracing clues, he also discovers a new model Replicant Rachael (Sean Young) that has been given a past and a real chance to develop an emotional core. Already plagued by his inability to trivialize the killing of Replicants, Rick is increasingly unable to separate his feelings between, humans, the rogue Replicants, and the one new model Replicant, that is almost indistinguishable from humans. Things come to a head when Rachael saves his life by killing one of the runaway Replicants. The movie is one of the best examples of creating a punk universe in visuals and sound. The screen is forever a kaleidoscope of garish lamps, rain, fog and humans of all hues and colors. The sound complements perfectly, evoking a beautifully melodic barren landscape. In fact the music promises way more than the cinematography of the 80s could ever hope to fulfill. The characters, true to the genre, are brooding, menacing and utterly egocentric (in a good way). The problem with movies like Blade Runner, for me, are the way cinematic elements of the era creep into an otherwise timeless experience. Action sequences for the movie, for example, seem to borrow heavily from the kung-fu mania of the time. In a world that is so beautifully crafted to be timeless, this anachronism is jarring at times. You almost wish they refreshed the movie periodically, updating sequences to be more in step with the time without redoing the rest of it. That I guess would be impossible till we do have Replicants of Ford to update the action sequences for us. When that happens, I suspect, we will be too busy retiring them to worry about updating movies.